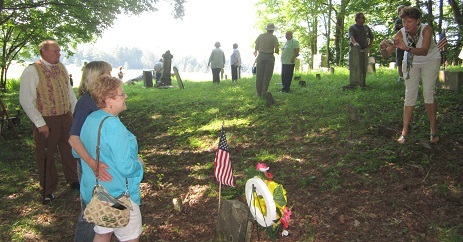 We’ve gathered today at this silent, slow, holy place to pay honor to two of our Younkin kinsmen who served their nation during the Civil War. The soldiers married Younkin sisters, the daughters of "Yankee John" and Nancy (Hartzell) Younkin. Another of the sisters, Polly Younkin, was my three-times great grandmother who married Henry Minerd. The first soldier we’ll honor is Alexander Sanner of the 62nd Pennsylvania Infantry, and the second is John K. Rush, of the 168th Pennsylvania Infantry. Alexander married Nancy Younkin. She was born in about 1829 in Hexebarger near Kingwood, Somerset County, PA. He was the son of Ludwig and Catherine (Lint) Sanner. He stood five feet, 8 inches tall, with blue eyes, brown hair and a fair complexion. They first lived in Normalville and later in or around Elliottsville. They had a dozen known children, born over a 23-year time-span between 1849 and 1876 – John "Franklin" Sanner, Matilda Catherine "Kate" Raymond, Eleanor C. "Ellen" McCann, Charles F. Sanner, Sarah Sanner, William J. Sanner, Marcellus Andrew Sanner, Ulysses "Grant" Sanner, Elliott Sanner, Alexander Sanner, Jacob Sanner and Isaiah Sanner. During the war, at the age of 41, Alexander agreed to be a substitute for George Kern. 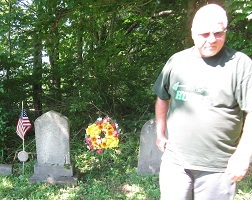 He joined the 62nd Pennsylvania Infantry. In October 2863, he was sick and absent from the regiment and was treated in Harewood Hospital near Washington. He remained hospitalized for the rest of the year. In May 1864, Alexander took part in the Battle of Spotsylvania -- The Wilderness. It was a bloody matchup between Grant and Lee. While no one side secured a clear victory, it was a slaughter of magnitude, with a combined nearly 29,000 combined casualties. At that battle, Alexander's right arm was hit by a minié ball which entered his hand and exited above the elbow. He was rushed to Judiciary Square Hospital in Washington, where the limb was amputated about 2.5 inches above the elbow. Within a few days, he was sent to McDougal U.S. Hospital in New York, and then in June to Philadelphia to the U.S. Hospital. The army eventually transferred him into the 155th Pennsylvania Infantry. In October 1864, while in Philadelphia, considered a "straggler," he was relocated to a hospital at Broad and Cherry Streets, where he spent the duration of the war. After the Confederate surrender, he was moved again to the U.S. Hospital in Chester, PA, from where he received his honorable discharge. Alexander also returned home to resume his life. Fifteen years later, Nancy died at the age of 51 in March 1880. A brief obituary in the Uniontown Genius of Liberty said her passing occurred "suddenly." Alexander survived his wife by a quarter of a century. As he aged, Alexander not only suffered from his atrophied stump but also endured natural disabilities of old age. He tried to wear a prosthetic arm, but it wasn’t comfortable. He also suffered from asthma, irregular heartbeat and a shrunken right breast. Friend George Browner, who had known Alexander since childhood, remembered him before the war as "a stout hearty young man and now he is quite a wreck." He advised the U.S. Pension Bureau that he was totally unfit for manual labor. In about 1890, he moved from the mountains into the Fayette County seat of Uniontown. Surgeons who examined him – in order to receive a military pension – noted in 1892 that his weight was just 125 lbs. At the time his monthly pension payment totaled $36. He died in Uniontown at the age of 82 in February 1905. After funeral services in his home, he was brought here to rejoin his wife after a separation of 25 years. Alexander’s obituary was published in the Uniontown Daily News Standard, which specifically noted his wife Nancy by name and said that he had outlived four of his children. Nancy and Alexander were included in several printed genealogy studies published over the years. Among these are The Sanner Family in the United States, by Wilmer Mackey Sanner (1968) and Sanders Saga, Century Enterprises Genealogical Services (1971). John’s second wife Syvilla Younkin was born in 1821 near Kingwood. The Rushes were pioneer settlers of Somerset County, having migrated from New Jersey. 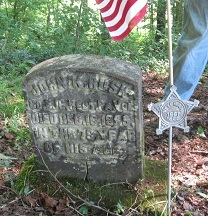 John's uncle Jacob Rush is said to been a soldier in the Revolutionary War, and John's father helped to found the Jersey Baptist Church. Their marriage was one of many between the Younkins and Rushes of southwestern Pennsylvania. They produced 9 children before the war broke out. Their children were Candace "Candy" Minerd, Alexander Rush, James Austin Rush, Patrick Rush, Sarah Rush, Mary Frances Brougher, Margery Victoria Williams, Alice Matlick, Sarah "Cecilia" Haines, Lavina Richey and Martha Rush. The daughter Margery was the great-grandmother of actress Shirley Jones. During the war, as the Union Army suffered growing casualties, President Lincoln issued calls for volunteer. 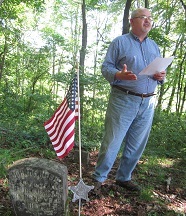 John was drafted and assigned to the 168th Pennsylvania Infantry. Their son Alexander also served with the 14th Pennsylvania Cavalry. Little is known about John's specific activity during the war. It left Washington in December 1862 was ordered to Suffolk, where it became a part of Spinola's brigade and moved to New Berne, NC. From there several expeditions were made, none of which resulted in battle. Proceeding to Fortress Monroe, it joined in the movement toward Richmond and with the Confederate army advancing into Pennsylvania was ordered to Harper's Ferry. However, the 168th was not destined to take part in the battle at Gettysburg but remained at Boonesboro. After a short period at Middleton, MD, the command was mustered out in July 1863. John returned home and resumed his life. Ten years later, Syvilla died May 1875, at the age of 54. Family friends Simon and Huldah Hager were at her funeral. The only known records of her passing are in the National Archives in affidavits given by their son Alexander and by the Hagers. John remarried for the third time to Mary Statler Dull who was more than a 50 years younger. Born under Statler, she was raised by a grandfather named Dull and took his surname as her own. ...the matter of the births of these children was not considered of any particular importance, no one now living having any recollection tending to show the exact dates and there is no record whatever; These people lived in the Mountains where the importance of baptism was not appreciated, they were ignorant persons and very very poor, the older members of the family opposed the last marriage and took no interest in the family born of that union. John suffered a stroke and died at the age of 79 on Dec. 16, 1889, at the home of his son Alexander. His daughter in law Amanda Rush also is interred here. No public or church records were made of John's death, nor the deaths of his wives. Other than the inscription on his standard issue military marker, perhaps the only documentation is in John's Civil War pension folder on file today at the National Archives. 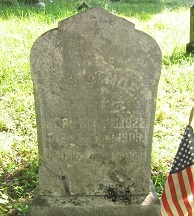 After his death, relatives pushed for the younger children to receive a Civil War pension and signed detailed affidavits. Many years later, in November 1975, their names were published in an article in the Laurel Messenger newsletter of the Historical Society of Somerset County. And that’s how we first learned about them. Younkin cousins from California, Maryland and Florida pose for photographs before returning to their vehicles (below).